A US government effort to build a multinational coalition to monitor North Korean violations of fuel smuggling appears to be gaining steam. The Trump administration, most likely at National Security Adviser John Bolton’s urging, appears to be reverting to the Bush Administration’s multilateral Proliferation Security Initiative (PSI) as a strategy to deal with North Korea. Chinese, Russian, Taiwanese and even South Korean shipping companies have allegedly violated UN embargoes on providing coal and oil to Pyongyang. In August, a South Korean shipping company was accused of shipping coal to North Korea. The coalition effort is part of a carrot-and-stick strategy by the US government, sources say. The coalition will include Australia, Canada, New Zealand and the United Kingdom. All are members of the Five Eyes intelligence alliance. However, it is unclear if any of the countries will commit ships. USS Blue Ridge has been designated as the command ship for the operation. The most interesting aspect of this story is how the organisation of the Enforcement Coordination Center on Blue Ridge ‘could be a trial run, or proof of concept if you will, for future multilateral headquarters operations in the event of future and different military contingencies’, said Robert Haddick, visiting senior fellow at the Mitchell Institute for Aerospace Studies, Air Force Association, Arlington. Haddick, the author of the book Fire on the Water: China, America and the Future of the Pacific, said the most likely contingency would be a future humanitarian assistance or disaster relief operation, a frequent event in the Indo-Pacific region. ‘But at the geostrategic level, the formation and exercising of a multilateral headquarters element in the western Pacific should be a subtle signal to China and the PLA [People’s Liberation Army] leadership that the United States and its partners are stepping up their preparations and readiness, beginning with practice at multilateral military command and control,’ Haddick said. Despite the potential for such an operation, there are doubts it will achieve much with regard to North Korea. One North Korea specialist, Kenneth Quinones, was doubtful the reincarnation of PSI would achieve any constructive results ‘other than allow Trump to claim he is being tough on North Korea while he continues to appease Kim Jong-un by praising him and seeking a second summit’. Quinones served as a member of the US negotiating team that formulated the 1994 US-DPRK Agreed Framework and was the de facto State Department liaison officer in North Korea between 1994 and 1997. The PSI concept goes back to John Bolton’s efforts as then undersecretary of state for arms control and international security affairs under George W. Bush in 2002. At the time, Bolton moved to block North Korea’s illegal export of drugs, counterfeit US currency, weapons of mass destruction and ballistic missiles with a coalition of US allies to track and intercept North Korean shipments. ‘The endeavour fell short of its goals because China and Russia did not participate in PSI and ally support for it faded,’ Quinones said. Politically it is easy to organise a multilateral headquarters aimed at countering North Korea, Haddick said. The UN Security Council has passed several resolutions against North Korea and these provide political and legal cover for countries to participate in the headquarters activities on Blue Ridge. This could be the basis of a future counter-China alliance, though no such thing ‘exists’ either legally or politically at present, should Beijing become an existential threat to the West, Haddick said. ‘That said, concern about China is rising in Australia and the Royal Navy just executed a freedom-of-navigation operation in the South China Sea,’ Haddick pointed out. This video is in the dialogue series of Takahiro Miyao’s video program: Culture and Creativity in Japan. This video is in the dialogue series of Takahiro Miyao’s video program, “Culture and Creativity in Japan“. 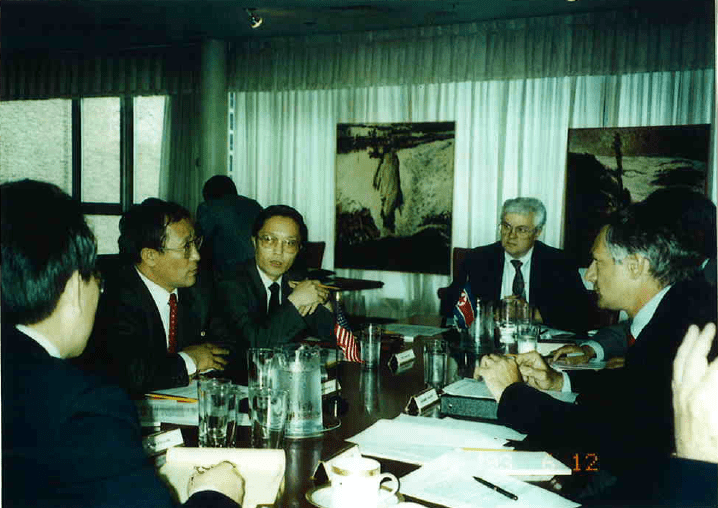 Dr. C. Kenneth Quinones (second from right) at nuclear talks with North Korea.